During the last decade, there has been an increasing public and scientific concern for the presence of micropollutants in the aquatic environment and the possibility of associated negative effects in aquatic organisms [1–4]. Micropollutants, such as ingredients of pharmaceuticals, human care products, pesticides as well as industrial chemicals, are often insufficiently eliminated by conventional wastewater treatment [5, 6]. Thus, in industrialized countries, wastewater treatment plants (WWTPs) belong to the major sources of organic micropollutants entering the aquatic environment . As a consequence, new additional treatment technologies, including activated carbon, ozonation or reverse osmosis, which were shown to have a high capacity for eliminating micropollutants [7–9], have been implemented more frequently in recent years . Up to now, the knowledge on possible advantages of further wastewater treatment for the health of aquatic organisms is still scarce. To close this gap, several case studies were conducted during the last years which proved biological effect monitoring based on biotests and biomarkers to be a useful tool to assess the effluent-related risk for aquatic organisms [11, 12]. Moreover, comparison of data obtained prior and subsequent to the installation of a new wastewater treatment technology [13–18] or of samples taken at different steps within the treatment process [19, 20] was shown to be a valuable strategy to evaluate the efficiency of this new technology. Especially in situ exposure (active monitoring) of caged fish has often been applied in this context [21, 22]. Compared to the passive approach, i.e. the capture and examination of feral organisms, active biomonitoring entails several advantages, e.g. knowledge about the exposure period and standardization regarding the age, size and reproductive stage of the exposed individuals. Furthermore, adaptive responses that may result in a desensitization of the organisms’ physiological responses can be excluded in active monitoring [21, 23]. Thus, caging of fish can help to control different parameters that might affect the subsequently analyzed biomarkers. The latter are defined as biological responses induced by a chemical or a mixture of chemicals, giving a measure of exposure and/or the toxic effect [24, 25]. 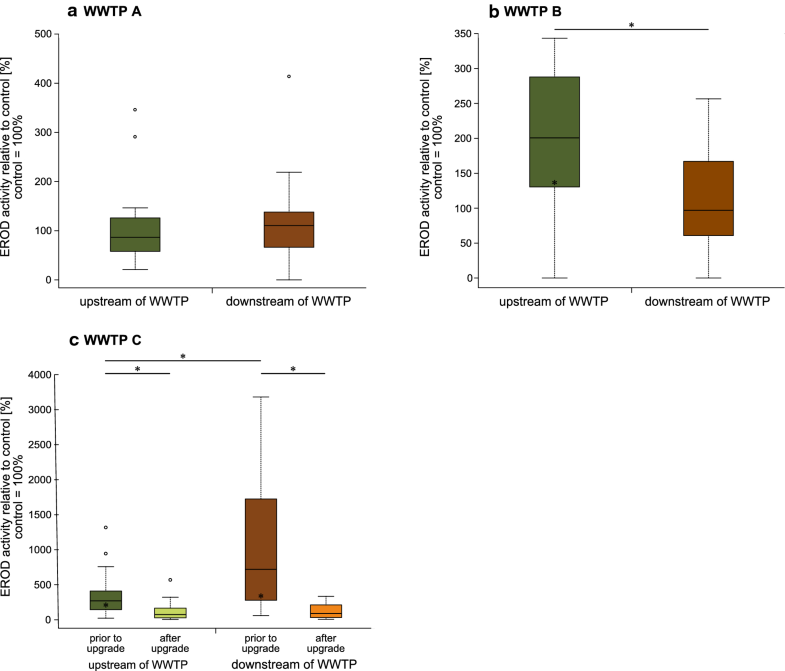 Such biomarkers, such as alterations in biotransformation enzyme levels, the induction of micronuclei and other abnormalities of the blood cell nuclei as well as histopathological reactions, may provide early warning sentinels for deleterious environmental and ecological effects of chemicals , and can be used to characterize the impact of WWTP effluents on the health status of aquatic organisms. 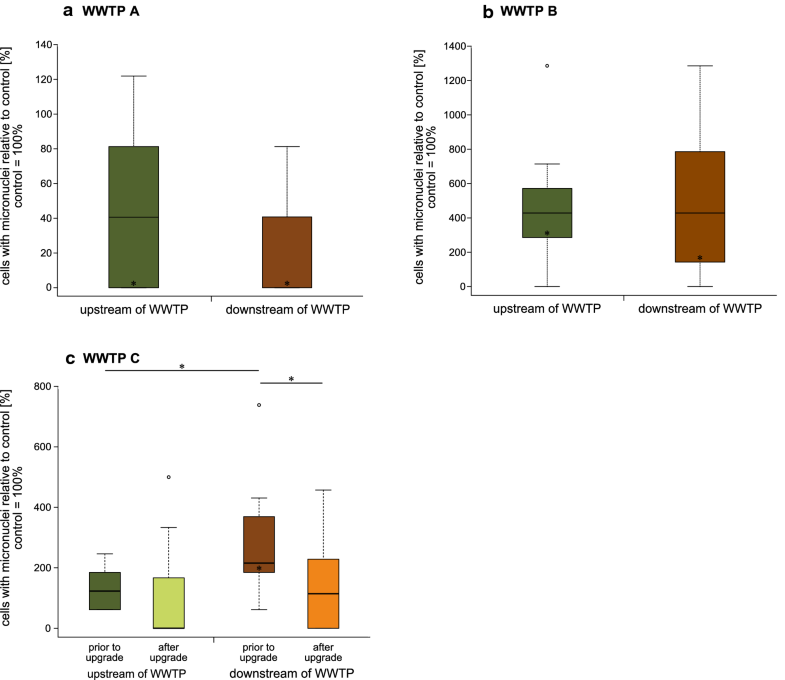 In the present study, in situ exposure of rainbow trout (Oncorhynchus mykiss) and subsequent biomarker analyses were used to examine the impact of three different WWTP effluents on the health status of the fish. Two of the investigated facilities were conventional treatment plants, combining mechanical, biological and chemical treatment. The third one, the WWTP Langwiese (Ravensburg, Germany), has been equipped with an additional powdered activated carbon stage in September 2013. To characterize fish health, two biomarkers were analyzed: (1) to reveal genotoxic effects, micronuclei were investigated in peripheral fish blood cells. Micronuclei are formed during cell division due to a failed reintegration of chromosomal fragments or whole chromosomes into the daughter nuclei. Although this may also happen spontaneously, high frequencies of micronuclei are considered indicative for the presence of genotoxic compounds in the water [27, 28]. (2) As a second biomarker, alterations in the level of the biotransformation enzyme CYPIA1 (cytochrome P450IA1) were measured by the EROD (ethoxyresorufin-O-deethylase) assay. CYPIA1 is mainly present in liver tissue and is involved in the detoxification of numerous endogenous and exogenous compounds . Previous studies showed high induction of EROD activity in fish after exposure to organic compounds, including dioxin-like substances, polycyclic aromatic hydrocarbons or structurally related chemicals such as several pharmaceuticals and pesticides [29–31]. Thus, high levels of CYPIA1 and, consequently, high EROD levels can be used as an indicator for exposure to such organic substances [29, 32]. In general, we could detect a high variation in micronuclei rates and in EROD activities when comparing the different controls of the three exposures. This variation was probably caused by the fact that the exposures were conducted in different years. Hence, different breeding cohorts, which might have been raised under different temperature conditions, were used, resulting in different micronuclei and EROD activity baselines. However, the high micronuclei frequencies in control fish of the exposure at WWTP A and the higher EROD activity in control fish regarding WWTP C were still in the range of control levels published previously [27–29, 46]. Nevertheless, due to the high variations in baseline levels and to relate the health state of fish exposed in the cages to the one of unexposed fish that were sampled at the same time and that were comparable regarding age, reproductive state (as shown by histological analyses of gonads), and origin, we decided to base our discussion on relative micronuclei rates and EROD activities. 12302_2018_154_MOESM1_ESM.pdf Additional file 1: Semi-quantitative histolopathological assessment of liver, kidney and gill samples of fish exposed up- and downstream of WWTP B. Samples were classified into five categories described in detail by Wilhelm et al. according to the symptoms displayed. Shortly, class 1 includes samples in control state, class 2 has been assigned to tissue samples displaying slight reactions, class 3 to samples with pronounced reactions, class 4 describes samples expressing beginning destructive alterations and class 5 has been assigned to liver samples with severe cellular destruction. Asterisks and horizontal lines indicate significant differences between two datasets according to likelihood ratio chi-square tests with subsequent Holm correction. 12302_2018_154_MOESM2_ESM.xlsx Additional file 2. All data.